With the words “Trust the first”, Intertops proudly promotes the fact that, in a highly competitive and increasingly crowded online gaming environment, they’ve managed to flourish for more than 20 years. The brand actually encompasses two online gaming venues, both accessible from the same site – Casino Red and Casino Classic. Intertops additionally offers sports betting services and a dedicated poker room. Dressed in an elegant red and black outfit, Intertops Casino Red makes its offering accessible through a well-structured and easy-to-use website. The bold menu on the left provides access to various site sections, and a Live Chat window, unobtrusively positioned in the bottom right corner, makes it easy to ask for assistance when needed. In order to claim a 100% Welcome Bonus up to $100, you’ll have to sign up, enter coupon code SIGNUP100, and deposit $20 or more. A second deposit with code WELCOME2 gets you 50% up to $100 bonus, the third 75% up to $150 (code WELCOMEBACK), and the fourth 100% up to $200 (code WELCOMEHOME). The 5th offer is completely free, meaning that Intertops will give you $25 with no deposit required. Having taken advantage of the first four “Rookie Raise” Welcome offers, the last one will be sent to you the next month by email. Bonus plus deposit have to be played through 30 times, and the no-deposit bonus comes with a maximum payout of 5x the bonus amount. The Wheel of Fortune promotion awards $50 to 20 lucky players each day, and playing any of the game gets you an automatic entry into the daily prize draw. Depositing $50 or more and wagering a minimum of $500 while playing on a mobile device could land you between $20 and $100 every week. The Comp Point program awards 1 point for every $10 wagered, with accumulated points redeemable for cash at a rate of $1 for each 100. 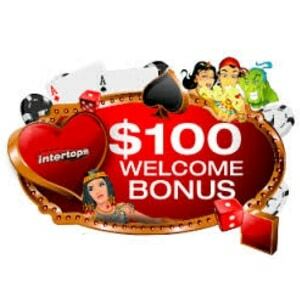 In addition Intertops Casino offers special leaderboard promotions with a different exciting theme each month. Each week hundreds of players are awarded a free bonus depending on their position on the leaderboard. Plus there's an extra draw each Thursday. If you place among the top 20 players in any week during the promotion period, you have the chance to win a $1,000 cash prize at promotion's end. Tournaments, some of which are freerolls, take place weekly, monthly, and during the weekends. This is yet another way to collect hundreds of dollars in cash prizes. Intertops Casino Red offers exclusively RTG games which can be accessed either via an instant-play version or by downloading the software. In either case, a simple 3-step sign-up process needs to be completed before you can launch any of the games. Download not only provides a larger selection, but also allows you to participate in tournaments. Among about 150 slots, you’ll find classics such as 7’s and Stripes and Santastic, as well as popular Naughty or Nice, Bubble Bubble and Sweet 16 video slots, and generous progressives like Jackpot Piñatas, Aztec’s Millions and Megasaur. Fans of table games get to pick from 20 Blackjack and Poker games, several Roulette varieties, Bingo and Keno. A large selection of Video Pokers includes Loose Deuces, Double Jackpot and European Slot Poker. Downloading the casino software additionally gives you access to live games. While you can launch them and observe for free, Roulette, Blackjack and Casino Hold’em can only be played for real cash. A great selection of games is also available to play on the go via an iPhone, iPad, Windows phone or an Android mobile device. The wide range of payment options available for making deposits include Visa and MasterCard, Skrill, Neteller, Sofort, EcoPayz, Bitcoin, Paysafecard and Bank Transfer. Payment limits depend on the method used, so while Sofort will allow you to deposit between $5 and $100, Skrill users can pay a minimum of $20 into their accounts, and a maximum of $5,000 per transaction. The majority of these options are also available for making withdrawals. Again, the amount players can cash out depends on the chosen banking method, but generally it’s limited to $2,500 per week. Skrill and EU SEPA Bank Transfer withdrawals, however, have no limits attached. All withdrawal requests are subject to a 48-hour pending period, and all transactions processed in 128-bit encryption. The site itself is well-structured and likely to answer the majority of questions you might have. In case it doesn’t, or you hit a bump while playing, assistance is available whenever needed. The Casino’s support team stands by 24/7 and can be contacted by Live Chat, toll-free phone number, email, or via Skype. You’ll be able to communicate with them either in English or German. Intertops has been entertaining us for more than two decades and that fact alone testifies to the quality of the operator’s overall offering. Partnering up with one of the giants of the online gaming industry has enabled Intertops Casino to provide a comprehensive gaming catalogue, which not only includes the best of RTG slots, but also an impressive Video Pokers library. Having claimed more than $500 in welcome bonuses, players get to enjoy rich ongoing promotional offers and take advantage of numerous seasonal deals. An attractive assortment of payment methods also includes a couple with no transaction limits, which is quite rare, and the cherry on the cake is that there’s someone to hold your hand 24/7, if needed.